In Untitled (Alabama), bold gestural brushstrokes of stark white paint coalesce into a procession of figures marching across a black color field. Triangular shapes at the right evoke hooded Klansmen. 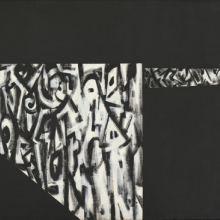 In this play of black and white, Norman Lewis deftly negotiated Abstract Expressionism’s disavowal of overt narrative and political content while also fulfilling his desire to address the Civil Rights Movement. 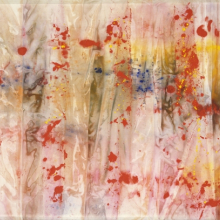 Stains of hot pink acrylic and splattered globs of red paint—formal strategies associated with Sam Gilliam’s Washington Color School abstraction—gain symbolic resonance when viewed in light of this work’s title, alluding to Dr. Martin Luther King Jr.‘s assassination on April 4, 1968. Having witnessed the riots that followed King’s assassination from his studio on U Street in the District of Columbia, Gilliam embarked on a series of works inspired by the civil rights leader. Moneta Sleet Jr.‘s photographs of the Selma-to-Montgomery March capture not only the movement’s leaders but also the sheer number of ordinary citizens who demonstrated. Braving the wet weather, participants walked uphill (both literally and figuratively) to the state capitol in solidarity for voting rights. 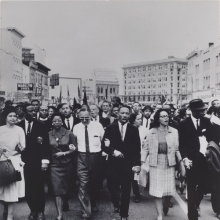 Two and a half weeks after the march began, Dr. King and others triumphantly led the crowd into Montgomery. The 1965 Voting Rights Act was signed into law four and a half months later. 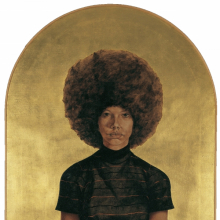 Barkley Hendrick’s Lawdy Mama embodies the “black is beautiful” mantra by conferring the awe and reverence once accorded Christian altarpieces on the figure of a beautiful woman crowned with a large, halo-like Afro. Inspired by gilded Greek and Russian icons as well as Renaissance altarpieces he encountered during a 1966 trip to Europe, Hendricks applied metallic gold leaf to a shaped canvas, effectively enshrining his subject. Norman Rockwell left his iconic position as an illustrator at the Saturday Evening Post in 1963 after forty-seven years because the magazine refused to publish his more socially engaged work. This painting was reproduced in a Look magazine article on integration in the suburbs. 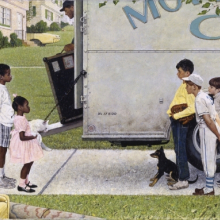 Rockwell’s decision to use children was deliberate, since they suggest innocence, and the baseball gloves allude to the great American pastime, a heritage shared by the children despite their racial differences. Abstract Expressionism, his chosen style, no longer seemed adequate to the political and social unrest of the times. Abruptly, the artist began creating nightmarish, cartoonlike figurative work, repeatedly using hooded Klansmen figures to emblemize America’s violent and malevolent side. In the early 1960s, David Hammons began creating “body prints,” a practice that involved coating his body with an oily substance and printing it onto a support, which was then dusted with dry pigments. 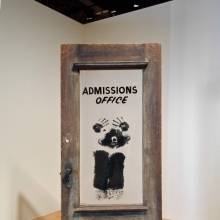 Here, the impression of Hammons’s body against the glass door of an admissions office recalls the struggles African Americans faced gaining entrance to public schools throughout the South. “Speeches, marches, rallies, and demonstrations filled the airwaves, newscasts, and Black artists’ consciousness nationwide. It was a call to all the aesthetically endowed to show up! Bring it: outspoken word, music with infectious cadence, images that look like me and mine, fond titles of ‘Sister’ and ‘Brother,’ and the Black community was utopia. 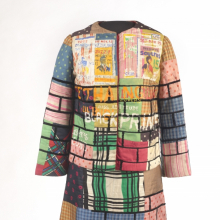 The 1960s was a period of dramatic social and cultural upheaval, when artists aligned themselves with the massive campaign to end discrimination and bridged racial borders through creative work and acts of protest. Bringing activism to bear in gestural and geometric abstraction, assemblage, Minimalism, Pop imagery, and photography, these artists produced powerful works informed by the experience of inequality, conflict, and empowerment. In the process, they tested the political viability of their art, and originated subjects that spoke to resistance, self-definition, and blackness. 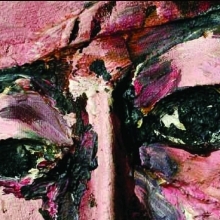 Witness: Art and Civil Rights in the Sixties is organized by Teresa A. Carbone, Andrew W. Mellon Curator of American Art, Brooklyn Museum, and Kellie Jones, Associate Professor, Department of Art History and Archaeology, Columbia University. A fully illustrated catalogue accompanies the exhibition. 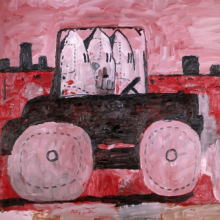 ​Major support for this exhibition is provided by the Ford Foundation. Additional support is provided by Barneys New York. Generous support for the exhibition’s education and public programs is provided by American Express.